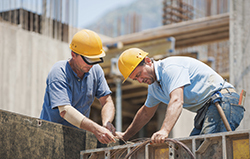 Businesses owners in the construction industry often fall behind on their accounting and taxes because they lack the time and energy required to complete these tasks on a regular basis. But to maintain any successful business, these functions are essential. If you’re struggling to manage your finances, consider using our New Haven, IN CPA firm for support. We work as hard as you do to deliver the construction accounting services, bookkeeping solutions, and tax strategies to help you build a thriving business. Our commitment to your industry is clearly demonstrated by our list of specialized construction accounting services including job estimating, job costing, and operational reviews. From commercial construction businesses to residential contractors and tradesman like electricians and plumbers, we offer a full list of services to satisfy all of your accounting, tax and bookkeeping needs. Douglas W. Perkins, C.P.A., Inc. uses hands on approach to working with our construction accounting clients. We get to know you and your business in order to craft a package of services designed around your requirements and business goals. Call us today at 260-493-3929 to learn more or request a consultation online now.